Flanked by towering stone and rock cliffs and shimmering Omani Gulf views, Six Senses Spa at Al Bustan Palace, Muscat, stands out against a spectacular Haijar Mountain backdrop. 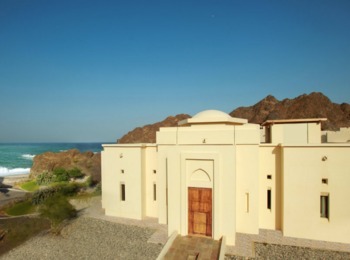 The beachfront property pays tribute to traditional Omani design, embracing architectural elements like arched walkways, domed ceilings, and falaj reflecting pools in a dramatic setting reflective of an Arabian-style fort. One of the largest spas region-wide, the lovely three-level facility offers massage, facials, body treatments, and beauty services.